Clove essential oil also known as clove bud oil is sourced from the native Indonesian clove tree which belongs to the evergreen Myrtacae family of trees. Three forms of oil can be derived from the tree – clove bud oil, clove stem oil and clove leaf oil. Of the three essential oils, clove bud oil is the one most used in aromatherapy because oil from the tree’s stems and leaves are known to cause irritation of the skin. Clove oil has been used for thousands of years and there are records of the ancient Roman and Greek civilizations using it to relieve dental pain and freshen up their breath. It has also been used in Ayurvedic medicine for centuries the same reason. 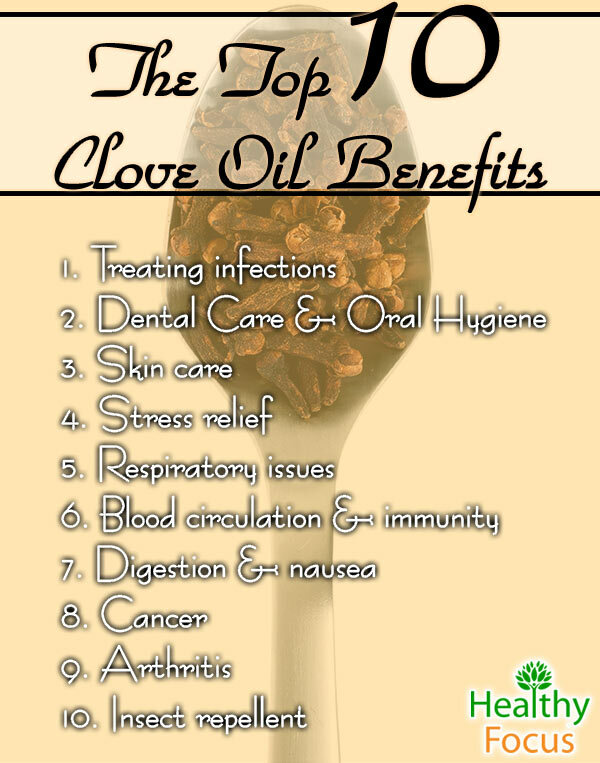 Even though we are now thankfully blessed with a dental profession, clove oil is still well known for its ability to treat dental and oral conditions including toothache, gum disease and canker sores. 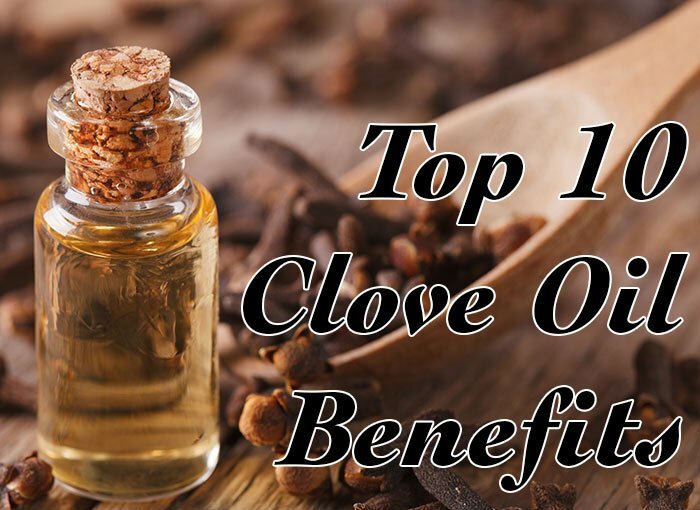 It is actually found these days as an ingredient in many commercial dental products but apart from its oral use, clove oil has many other health benefits that might not be quite as well known. Its medicinal benefits include antiseptic, anti-inflammatory, anti-fungal, antiviral and expectorant properties among many others. Because of its excellent antiseptic properties, clove essential oil can be applied topically to help treat minor wounds, cuts and insect bites. It is also an excellent natural anti-fungal remedy which is effective against fungal infections like athlete’s foot and candida. Clove essential oil is strong oil which may cause irritation and it should always be diluted properly before you apply it to the skin. Despite its various uses, clove oil’s main use is still in oral hygiene and dental care and is certainly the most popular essential oil to treat oral complaints. The potent antibacterial and germicidal properties already mentioned make it extremely effective for anybody that is suffering from painful toothache, mouth ulcers and sore gums. Clove oil contains up to 90% eugenol and this compound has a long history of use in dentistry. As well as treating gum and tooth infection and relieving pain, clove oil has a characteristic clean scent which can help eliminate bad smelling breath. Clove oil can be applied to a small cotton ball and applied to a tooth overnight to treat cavities and has in fact been used traditionally in Ayurvedic medicine for that purpose for centuries. As we have already mentioned, clove oil is often found as an ingredient in many dental products including toothpastes and mouthwashes and it is sometimes used by dentists to prepare temporary filling materials. It can also be applied to canker sores for pain relief and to combat infection. While it is very effective, you need to make sure that you dilute your clove oil properly because it has the potential to burn inside the mouth. Even though it is not one of the best known essential oils for skin care and skin complaints, clove oil is can effectively treat many common skin conditions like acne, wrinkles and warts. Clove oil is often found in anti-aging skin products because it can rejuvenate and stimulate the flow of blood. Many essential oils are used to effectively relieve emotional problems like stress. Essential oils are safer and far more natural than the prescription medications that so many people are reliant on. If you are feeling stressed out and finding it hard to deal with everyday issues like work, study or family then diffusing this wonderful oil through the home or he office might have a very positive impact. Of course, stress can be a very serious issue with some serious knock on effects and there is no guarantee that clove oil will work but it is certainly worth a try without the risk of side effects or addiction. Clove bud oil has expectorant properties and another of its many uses is to ease respiratory complaints such as coughs, sinus issues and asthma. Where I live in South East Asia, chewing on a cold bud is actually used to help respiration and to heal sore throats. Clove oil has a cooling anti-inflammatory effect and is also able to free up the nasal passages helping you to breathe more easily. Clove oil has also been used traditionally to treat a range of problems related to the stomach including indigestion, flatulence, nausea and motion sickness. If you are feeling bloated, try massaging some clove oil mixed with a good carrier oil into your abdomen and you will hopefully feel better very soon. If you are suffering from swollen and painful joints, try a clove oil massage or simply add a few drops to your bathwater, sit back and relax. As well as its many benefits to your health, clove oil can be used as an effective insect repellent to keep your home clear of those nasty creepy crawlies. Try diffusing it to keep mosquitoes at bay or make a repellent spray by adding a number of drops to a spray bottle of water. • Make a massage oil by adding a few drops of clove oil to your carrier oil of choice. • For respiratory complaints, you can inhale it either directly from a handkerchief or your hands. However, the most effective way to treat a respiratory complaint is to add a few drops to a steaming sink of hot water and making a steam inhalation. • To treat skin conditions like acne or athlete’s foot, add a few drops into your normal skin care product or mix it with some jojoba or coconut oil. • For toothache and gum pain, add a drop of diluted oil to a cotton ball and press the ball into the affected tooth for 20 or so minutes. • Diffuse it through the home to ease your stress, headaches and repel insects. • Do not take clove essential oil internally. 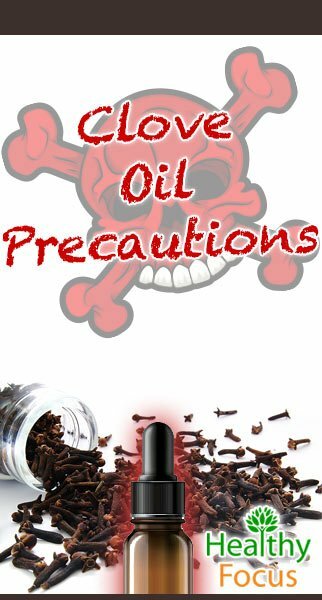 • Always dilute clove oil with a carrier oil before applying it topically. Clove oil is very strong and can cause serious skin irritation when used neat. You should also perform a patch test before using it for the first time. • Don’t use it on broken skin. • Pregnant and nursing women should exercise special caution. • People with kidney and liver diseases should avoid clove oil.